July 14, 2015 (CHICAGO, IL)—Elmhurst Art Museum presents the world premiere of Chicago-based artist David Wallace Haskins’ Skycube outside the Museum 24/7 beginning July 30, 2015. A three-ton construction of steel, glass and far infrared light film, Haskins’ 8 x 8 x 8 foot Skycube brings the full vertical dimension of the sky down to the pictorial plane. Seen at eye level through a square aperture cut into the white steel cube, the moving image of the sky is not a digital projection or display—it is the actual three-dimensional sky. Bridging sculpture, architecture and painting, Skycube is the first public exhibition of Haskins’ groundbreaking work. During the day, atmospheric changes move across the Skycube’s exterior aperture like a living painting continually recreating itself. Walking up to the opening reveals an interior 8 x 8 foot wall appearing as an immersive three-dimensional mural of the sky. In the evening, the Skycube moves through endless hues of blue until a deep black square emerges, slowly revealing a composition of moving stars and planets. 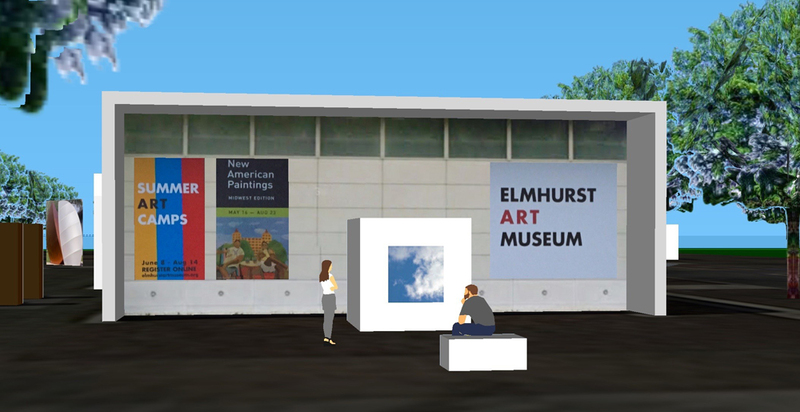 Elmhurst Art Museum’s presentation of the Skycube is free and open to the public outside the Museum 24/7. It will run through the spring of 2016, when a solo exhibition of Haskins’ poetic and interactive work will open at the Museum. EAM is located just 14 miles west of downtown Chicago and one block from the Elmhurst Metra station. For more information please visit www.elmhurstartmuseum.org. An Elmhurst native, artist David Wallace Haskins conducts experiments and explorations with light, space, time and sound. While working with experts in psychology, ecology, physics and philosophy, Haskins leads a core team of likeminded artists and technicians to develop and evolve these experiments into innovative installations, sculptures and events. See more of his work at www.davidwallacehaskins.com. Elmhurst Art Museum is located in Elmhurst (IL), a city of 44,000 located 14 miles west of downtown Chicago. The Museum is a 501(c)3 organization dedicated to education and exhibitions focusing on modern and contemporary art, architecture and design. The collection includes the McCormick House, one of only three single family residences designed by Mies van der Rohe in the United States. Summer hours are 11 a.m.-5 p.m. Tuesday, Wednesday, Saturday and Sunday; 11 a.m.-7 p.m. Thursday and Friday; closed Mondays. Admission is $8 for adults ($7 for seniors) and free for students and children under 18. Admission is free on the first Friday of each month unless otherwise noted.